Warranty: Guaranteed to be free of defects in materials and workmanship. An authorized dealer or the manufacturer will either repair or replace the product at their discretion. I was introduced to backpacking about 16 years ago when I met my husband. We have been backpacking, canoe camping, car camping, hiking, and participating in all sorts of outdoor activities together ever since. We live in a border town (US & Canada), so we spend lots of time in both countries for our outdoor excursions. When making a decision on gear, I like to go lightweight and practical. I pack as light as possible without denying myself little luxuries. Spiderweb Chassis Harness - This is a three strap system: two that go vertically across the dog's belly and a third that goes across the chest with a branch that goes between the dog's front legs to attach the vertical strap that goes just behind the dog's front legs. The portion across the dog's back is padded nylon. The two horizontal straps have a short length of elastic sewn to the nylon strap to add a bit of slack to accommodate the dog's movement and breathing. There is a small triangle of padded nylon that is at the center of the chest strap covering a plastic ring. 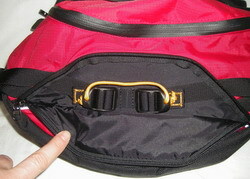 Both of the vertical belly straps have a padded nylon sleeve that covers the strap. All the straps have keepers to prevent any adjusted length of the straps from flapping around. 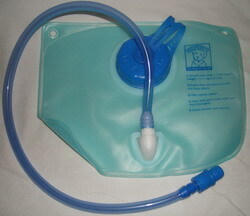 Integrated Water Bladder Hydration System - This has two access points: the first for filling is located inside a zippered pocket in the main pocket of each saddlebag, and the second is for accessing the hose for on the trail use and is located at the front of each of the saddlebags. The bladders are independently fillable so that the load in each of the saddlebags can be balanced by partially filling the bladders. Assistance Handle - This is integrated into the harness. 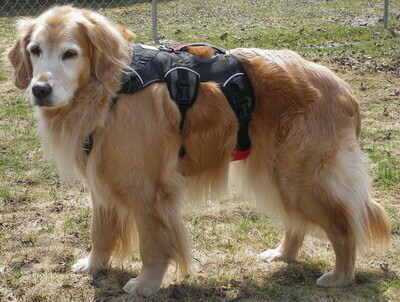 It is a reinforced nylon strap that runs horizontally just behind the dog's should blades. Removable Saddlebags - There are four buckles and two hook and loop fasteners that keep the saddlebags attached to the harness. The four buckles are located one at each corner and the hook and loop fasteners are on the underside of the saddlebags and attach around the vertical strap just behind the dog's front legs. Horizontal Internal Compression Strap System - Inside the smaller accessory pocket is a buckle system that compresses the volume of the main pocket of the saddlebags. Weather resistant coating on the zippers. Additional 'daisy chain' tie points along the top of the saddlebags for attaching gear to the top of the pack. Strategically placed drainage holes in the bottom of the pack. Ventilation holes in the bottom of the accessory pockets. A metal leash clip on the top of the harness. An additional nylon loop on the back of the harness, for what I'm not sure yet, but I'm sure I'll find a use for it! Overall, this is a well designed and well made pack that provides many features that a backpacker would find on a pack designed for human use. I took Morgan into our backyard and let her try out the pack so that I could get some pictures for this report. I set the pack on her and started to adjust the straps. It immediately became apparent that it would be a lot easier to do without the saddlebags on the harness. I removed the bags and things went smoothly from that point on. There is lots of padding on the harness straps and little protective pads behind each of the buckles so that the buckles won't rub against Morgan's fur. Morgan has worn lots of harnesses and packs before so she didn't mind the Ruff Wear pack or harness either. When I put the bags back onto the harness, I got them turned around backwards. I did not notice this until I was all finished and had the pack off the dog and I was looking at the features for writing this report. It is interesting to note that the buckles clip on fine with the bags on in both directions, so it could essentially be worn either way with the exception of not being able to access the lifting handle with the bags on backwards. Over the next four months, Morgan and Fergus will be using the Ruff Wear Palisades Pack for any day hikes or backpacking trips they accompany us on. I look forward to reporting on the results they experienced while backpacking this season! 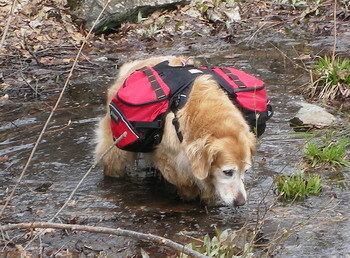 Morgan has worn the pack on our hiking and backpacking outings. Most of our hiking and backpacking has been in the Hiawatha Highlands and Voyageur Trail system areas in the Algoma region just outside of Sault Ste. Marie, Ontario. These two areas have many linked trails meandering through red and white pine old-growth forests and dense boreal stands of jack pine and spruce linked by a network of rivers, lakes, and wetlands. Elevations range from 225 to 315 m (738 to 1033 ft) above sea level. We have also ventured up into Lake Superior Provincial Park, about 2 hours north of Sault Ste. Marie, Ontario. The terrain here consists of trails similar to those found along the Voyageur Trail with the addition of rock and pebble beaches, long sandy stretches, and numerous stream crossings. We hike an average of 5 km (3 mi) per week. Sometimes this would be a 2 km (1.2 mi) trek, others times it would be a 7 km (4.4 mi) trek. Over the past two months, I estimate Morgan has worn the pack for 10 km (12,5 mi) of trails and bushwhacking. This is a very rough estimate though, as my husband and I only walk along the our path once, but Morgan trots and runs all over in the bush, running up ahead and coming back to us the entire time we are on the trail. She is not leashed when we are hiking and backpacking unless we are in a well traveled area. A rough estimate would be her traveling 3-4 times the distance we do depending on how interesting the bush is along the trail. The weather has been cool for spring; temperatures have ranged from 0 to 24 C (32 to 75 F). Although we haven't had any snow as precipitation, there has been snow pack in the bush into early June this year. The skies have been clear, cloudy, and dark with thunderstorms over the field testing period. Putting the pack on is a simple process, we start out at home by putting the harness. She typically wears this until we either stop for the night, or we finish our day hike. 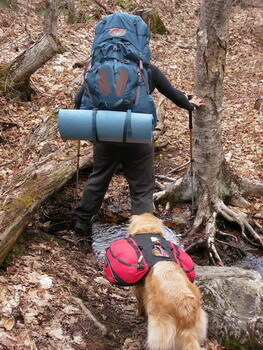 Once we hit the trail head, I clip the pack onto the harness. The clips are very accessible and easy to use. The hook and loop fasteners are not as easy to access. Morgan's long hair makes it difficult to see and the hook part collects her hair very easily. It takes me longer to get those two straps done up than it does for me to put on both the harness and the clips for the pack. The fuller the pack is, the more challenging it is to get the fasteners done up. A different style fastener such as a clip or a snap of some sort would make this a much nicer feature. On our first backpacking trip of the season, Morgan wore the pack while we bushwhacked through about 4 km (2.5 mi) of unmaintained trail and bush. She carried her sleeping bag, her food, her doggie first aid kit, and her boots when she wasn't wearing them. The pack was really put through quite a lot as she ran through the bush, into muddy puddles and boggy areas, over logs and brush, along large flat rocks near the shore of a small lake, and over boulders. She even got into a stream that was up to the pack in depth before I could tell her not to. When we fill the pack with her things on a backpacking trip, it can get flopping around if I don't get the hook and loop fastened properly. Once I have it done up and we are set to go, Morgan charges off down the trail hardly noticing she is wearing the pack. It slides a little from side to side with the cadence of her gait, but it is a natural looking swing. When she stops briefly, the pack stops and re-centers on her back. As long as I have the pack weighted evenly on each side, it will stay centered. I haven't had the opportunity to use the bladders as counter weights to keep the load balanced. As she is an older dog, I try to keep the weight she is carrying to a minimum so the addition of water to the bladders would be an unnecessary weight on her back. I am able to balance her load easily enough. On other hikes, I have cinched the compression straps right down when she was carrying very little - a leash, her first aid kit, and boots when she wasn't wearing them. The pack does very little flopping when it is worn like this. The assistance handle on the top of the harness has been very useful when I quickly need to grab Morgan to either keep her from heading into something I don't want her in or when we are passing another hiker on the trail. The hole made in the back panel portion of the packs allows me to access this when she is carrying the packs as well. When the pack is fully loaded with her stuff, it has quite a wide profile. She has never gotten used to being careful when carrying any pack while going through trees that are close together or through dense bush. The pack was frequently bounced off the side of a tree or dragged through close branches. Despite this, the pack is free from any rips or tears. It does show the usual signs of use and accumulated dirt, but nothing more than I would expect considering what Morgan takes it through. Most dirt is easily wiped off when we finish for the day. Morgan has continued to wear the pack while we are hiking on my local area trails. A description of the trails can be found in the Field Report. We hiked about an additional 10 km (6.2 mi) with the pack over the past two months. The weather has been cool for summer; temperatures have ranged from 15 to 28 C (59 to 82 F). The skies have been clear, cloudy, and dark with thunderstorms over the long term testing period. The Palisades Pack has continued to perform admirably for the day hikes we have used it on. Morgan wore the pack on two further day hikes, carrying her leash, some doggie pick-up bags, a few treats, and a small doggie first aid kit. The pack was compressed down to its smallest volume. I was able to evenly balance the load between the two sides without a problem. The pockets are very accessible and it is easy to stop on the trail and get out what I needed from the pack. Morgan didn't mind carrying the pack, although she did enjoy the freedom of having it off once we got to our destination. The hook and loop fasteners that attach the side bags to the harness became more of an issue with Morgan's long hair as the testing period went on. It is very difficult to get all of the hair out of it. Before beginning each trek, I would make sure that the hair was clear of the fastener, but if I did any re-adjusting or removing of the pack, it would immediately pick up more hair and not stay fastened as well. 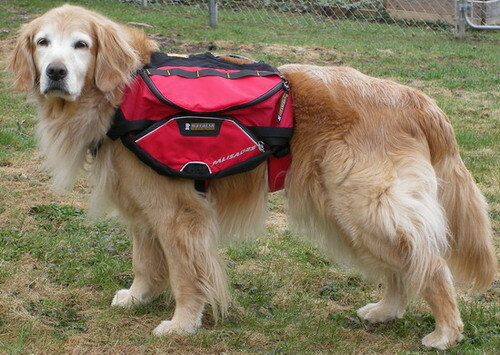 This pack is a well featured pack for any companion dog on day hikes as well as overnight trips. If the hook and loop fasteners were replaced with either a buckle or snaps, it would be the perfect dog pack. This concludes my Long Term Report. Thank you to BackpackGearTest and to Ruff Wear, Inc. for the opportunity to test the Ruff Wear Palisades Pack.